Mountain Dew how it used to be apparently. The can says it is “made with real sugar”, I guess that is as opposed to the corn syrup that the Americans usually use in their soft drinks. 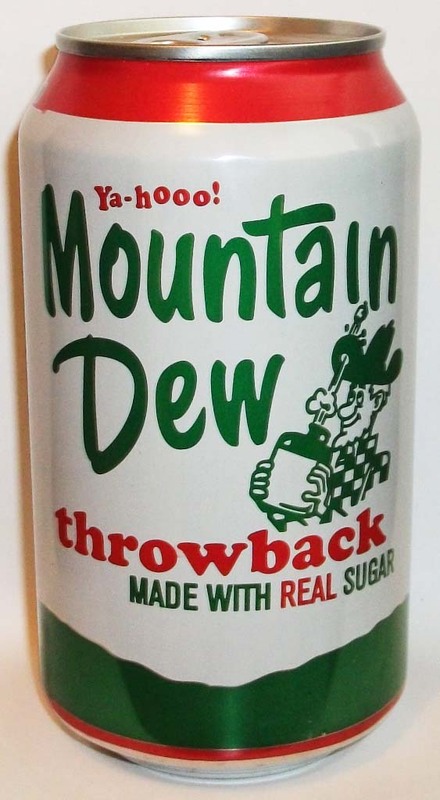 The design of the can is completely different to the design and branding off all the other Mountain Dew products, the design of which is based loosely on the original Mountain Dew logo from the 1970s. The actual flavour of the drink is a lot smoother and lighter than regular Mountain Dew, and if you pour it from the can you’ll also notice it isn’t bright yellow either – just a paler yellow instead. I’d have to say I enjoyed it just as much as regular Mountain Dew and I’d hazard a guess that due to the fewer ingredients used it’ll be *slighter* better for you.